In the summer we like to barbecue with my siblings. It's relatively fast, you keep the heat outside, and the food is always great. One thing that finds it's way to all of our family BBQ's is twice baked corn on the cob. It's another relatively simple recipe but when friends taste this corn their reaction is always the same. Their eyes get big, you hear a big Mmmm, and they look down at the corn wondering what you did to make it so tasty. That's it! Shuck the corn, boil it in water for 10 minutes, while the corn is boiling mix together the olive oil and fresh lime juice, sometimes its easiest to do this in the blender so it emulsifies well. You can more easily extract the lime juice by cutting the lime in half and putting them in the microwave cut side up for 15-20 seconds until almost warm before you try to squeeze them. Then using a pastry brush baste and bath the boiled corn cobs in the lime mixture before throwing it on a medium heat grill. Rotate corn every few minutes until grill lines appear all the way around the cob. You can continue to baste it as it grills. Yes, these babies are eaten how they come off the grill. No need to add butter, the lime and olive oil does the trick and gives it a unique delicious flavor. Salt and pepper to your liking. 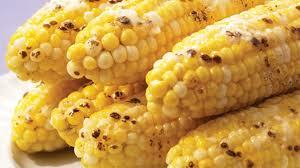 This corn will melt in your mouth. Enjoy!